Situated about 65km SE of Junagarh district in the state of Gujarat in South West India, the National Park was established on 18th September, 1965, as a Forest Reserve, primarily to conserve the Asiatic lion-classified as one of the World's most threatened species. 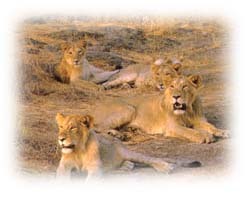 Now Gir National Park is the only remaining place in the world, where one is likely to see the Asiatic Lion. The sanctuary covers a total area of 1,412 sq. km of which 258 sq.km at the core forms the National park. Permits are required to enter this part of the sanctuary. The land is rugged with deep ravines, steep rocky hills and plenty of rivers. The vegetation, mainly along the main rivers and streams is mixed deciduous, with Teak, Acacia, Jamun, Tendu and Dhak trees, interspersed with large patches of grasslands and offers the visitor long pleasant drives, through the thick forest cover. These trees are mostly broad leaved and evergreen, giving the area a cool shade and moisture content. The Gir forest is dry for most of the year with scrub trees, like babul and few flowering trees. Prosopis and Casuarina have been planted in the coastal border as part of the aforestation plan. The Asiatic lion once had a wide range in natural territory running from NW India through Persia to Arabia. But unfortunately hunted as a coveted trophy item during the British Raj era, it is now only found in the Gir forest of Gujarat. The famine of 1899 so decimated the Asiatic lion population that Lord Curzon cancelled his shoot at Gir, where he was staying as the guest of Nawab Junagadh. Curzon persuaded the Nawab to protect the remaining lions. In 1965, the India Government declared this place as a National park. The lion population which had sunk to an alarming two dozen in the early 20th century has slowly climbed over the years since, and now numbers about 300. Within the sanctuary, there are numerous human settlements of cattle herders called Maldharis. There are also places of Hindu worship and pilgrimage and sulphur springs at Tulsi Shyam and Kankai Mata. At the edge of the park there are good populations of Indian Gazelle, protected by the religious sentiment of the local people.